THATCamp College Art Association (CAA) 2014 | See you in Chicago in spring 2014! See you in Chicago in spring 2014! After presentations, and reflections this morning, we’ll be working together in informal group sessions to respond to the following discussion, reflection, and action items. The hope is to leave THATCamp and CAA with something to build on, both digitally and through the new, collegial bonds formed from face-to-face interaction. The Google Doc is here and can be added to by anyone at the session–or following along via Twitter or elsewhere. Please participate! What are the most pressing issues and/or opportunities for you in the field today—digital, or otherwise? Is it tenure, publishing, sharing your ideas, adjunctification…..
How/does the digital offer an opportunity to move forward/press/rethink this issue? What can you do? What can CAA do? What kinds of panels might you want to see/help facilitate at THATCamp or CAA in the future? Becky Huff Hunter introduced the session with some questions: What are some examples of alternative/experimental forms of art writing on the web? Have attendees been involved in web-based writing? What’s the impact of new forms of writing on artistic, curatorial, and scholarly practice? Dewitt Godfrey, CAA President Elect, commented that he wants to engage the ways in which artists and scholars work online, in order to better serve the CAA community. CAA has an online journal, but what else could be offered? Archnet—designed to bring together Islamic world architects and scholars: threads where people discuss things like “how does one define Islamic architecture?”; visual database, image archive detached from text streams; scholarly articles, also disconnected from current text streams and image database; problem maintaining the quality of the conversation. – why a book – Charlotte set up a project to play around with what an art knowledge object might be. This was for the authors involved in the project, so that they can have something published and peer reviewed. The book was for other people, not so important to Charlotte. She uses herself as a guinea pig. – is there a different approach to using these online tools, or are we using them in the same way as anyone else? 2010 – Michael Mandlberg collaboratively wrote a book Collaborative Futures (on bookie) – eg, as artists we’re used to experimenting, tradition of being encouraged to break things and to work against the grain – the avant garde role or the irreverent role of the artist. Here is the pdf of my presentation. The painting discussed can be found here: http://www.davidmus.dk/assets/345/20.3-46-1980-Miniature-Paladshaver.jpg. 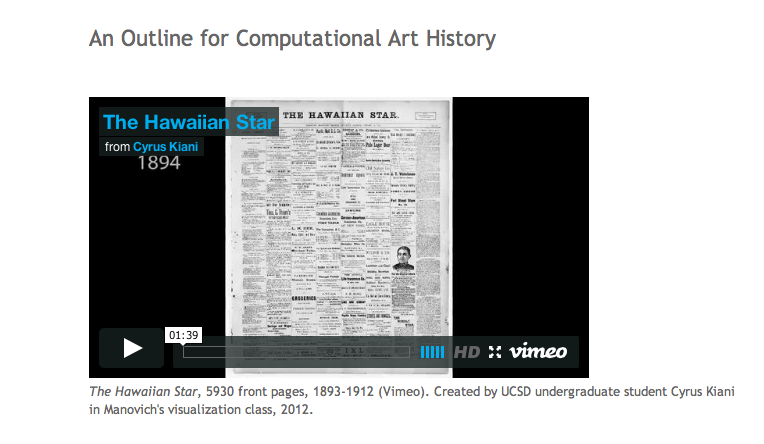 Slides and links from the February 11th 2014 THATCamp CAA session on applying computer vision techniques to art history research, facilitated by John Resig. Notes from What Are We To Do About Our Lack of Access to Images of Copyright-Protected Contemporary Art? What are we going to do about copyrighted images of contemporary art? How much of this is self-censorship? How much are academics and librarians simply afraid of litigation? The full outline for Lev’s talk, which is being given simultaneously (and for a longer 1.5 hr session) at the Graduate Center, CUNY in New York, is here. Use this webpage to supplement the onscreen/on air discussion. changing the “textbook” from chronological to something else: thematic (like “communication”), then use a crowdsourced materials (“why do we look at old things”) to create a customized syllabus. no need to reinvent the wheel. what is it to teach thematically? do we focus too much on finding the right tool instead of creating the right content? incorporating media – wikipedia, new media techniques, etc. having students blog, sharing that content on social media like twitter, facebook, etc. using twitter to write a joint paper. crossing national boundaries to collaborate on work (with blogs/digital online writing). what skills do we need to cultivate with the students? maybe look at k-12 and museum education for guidelines. more opportunities for the visual. how do you deal with more traditional mindsets against digital/interactive teaching? and how do you deal with the students who just won’t get involved? how do you show the material is getting through to the students? (assessment strategies). individualized feedback, etc. I’d like to propose a General Discussion/Working Session hybrid about the D. James Dee Photo Archive, approx. 250,000 transparencies, slides, and negatives documenting contemporary art in NYC (particularly Soho galleries) from the late 1970s – present. Artstor acquired the archive this summer and is in the process of figuring out how to digitize it and, more importantly, catalog it. The collection isn’t cataloged and the slides aren’t labeled so any effort to effectively describe it will be a collective effort. I’m curious to hear what people think about crowd sourcing, tagging, and any other ideas. The BBC’s Your Paintings project is one example of a successful tagging project but what about extensive crowd sourced cataloging, how much metadata is needed before images are released, is it best to open the cataloging to everyone or a select group? A common theme as people introduce themselves is wanting to get *good* tags in addition to tags at all — possibly using controlled vocabularies. Ian asks whether people do know of available tools to use — there are problems with using vendors, and there are other problems with “rolling your own” platform. One participant records Artsy’s experience using Mechanical Turk: it took a developer a couple hours to sync the database with Amazon’s, and thereafter it cost about 1 cent per image even with having about 5 people tag each one. Concerns, though, with labor ethics and with image rights. The Carnegie Mellon program had a Teeny Harris program to get people to identify who’s in the photo. John Resig brings up a case where a lot of crowdsourced work that had happened over the course of years was replaced in an afternoon by an advanced “computer vision” technique that helped identify things in photos. General point: before you turn to crowdsourcing, talk to advanced computer scientists to make sure that there’s not a computational technique. Participant wonders what information would be most needed: gallery, creator, year, people, etcetera. Amanda brings up LibraryThing’s Legacy Libraries and suggests having a “barn-raising” — an event to engage the community as well as to get some items tagged or cataloged. Ian agrees it can be a terrific jumpstart in particular. Participant raises the issue of how you reach people who “aren’t on the Internet all the time.” John Resig also raises a concern about just expecting people to do all the work: important to “chunk” the work so that it’s doable. At the same time, there are many people who do care passionately about particular items or topics. Participant raises the topic of errors in crowdsourcing: Ian mentions that many projects will only accept data once it has been verified by multiple people. Participant brings up the example of the Steve.Museum, where the curation had to happen after all the tagging. John Resig talks about how often it takes thousands of cases in order to train computer software, so unless your set has thousands and thousands of items, in some cases you might as well just do the work manually yourself, or crowdsource it. Participant brings up search by image — how does it work? John is going to talk about some of that in the next session. -how to create a digital experience? -how make intuitive to participant? -? why chose physical and/or online space? -digital space as a freer space? fewer authoritative voices? -?computer as frame to a work of art?? -how do digital media change ideas/notions about “curation” – does curation become a more collaborative/inclusive process? how is process changed? -do works for art get changed or understandings/perceptions? new questions? -? new kinds of ephemerality with dig media works and curation? -?s of preservation/archiving – of digital life cycle with digital works and curation? -?s of didactics/interpretative materials and discursive spaces of galleries – what is lost? how restore immediacy of engagement with objects? -how democratize selection, interpretation and (interactive) experience? -how does digital curation change curatorial thinking and practices and/or participant experiences/expectations?